Learn to make Bharwa Bhindi Recipe | Stuffed Okra Masala Recipe with a simple and easy video tutorial. 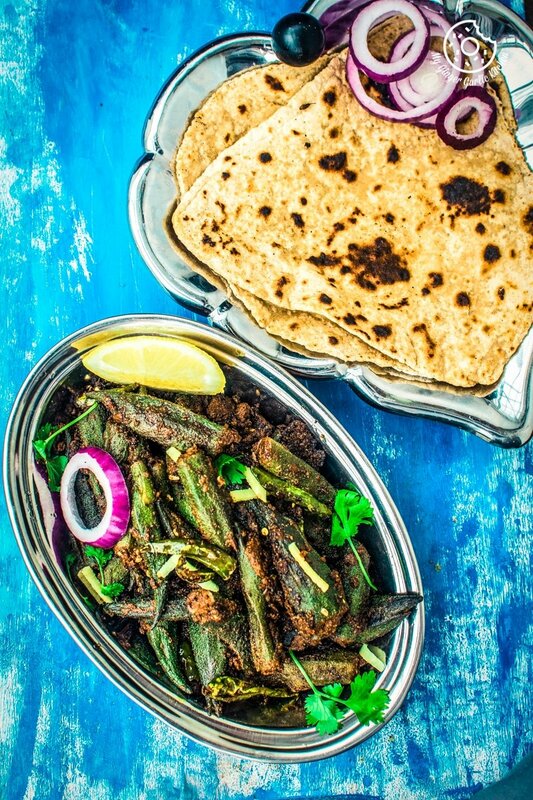 What is Bharwa Bhindi or Stuffed Okra Masala? 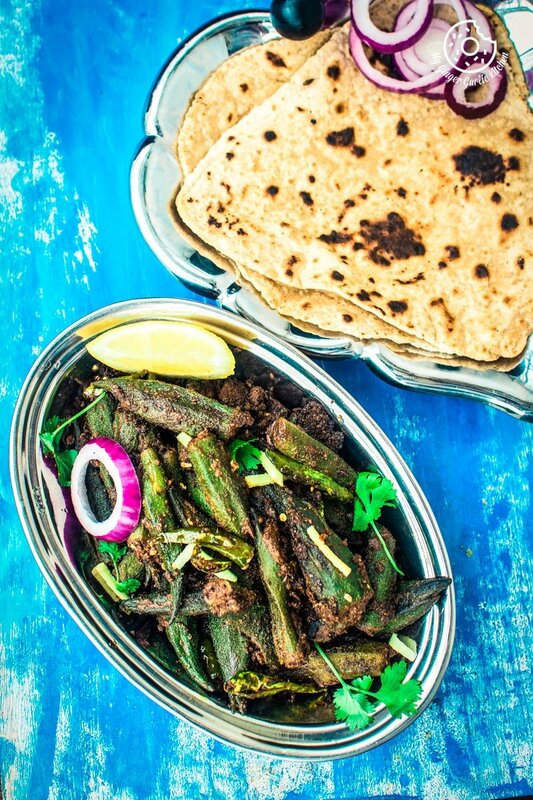 Bharwa Bhindi (भरवां भिंडी) is a very crowd-pleasing and delicious Indian vegetarian side dish which is made with Bhindi (aka Okra or Lady Finger), which is stuffed with a tangy and spicy, powdered masala filling. This is a vegan and gluten-free dish which goes really well with any kind of roti, paratha or puri. What are the things you should consider when making Bharwa Bhindi? Any time you make any okra or bhindi dish, make sure that bhindi is thoroughly dried. If there is any kind of moisture left after washing, then okra turns out pretty soggy and gooey, and okra doesn’t taste good when it’s sticky. What is the best way of making Okra towel dry? There are two ways of making okra dry. The first way, you wash the okra a couple of hours before you plan to cook and let it get dry completely on a kitchen towel. You can also wash okra a day before you are planning to cook it. The second way is to wash okra and dry every single pod using a paper/kitchen towel. Which method of drying okra (bhindi) is more advisable? Both of the above-mentioned methods are great. The only difference is that the second method requires some time and effort. So it is advisable that you wash okra few hours before and let them air dry on a kitchen towel. This way you would save a lot of time and energy. How should we make masala for Bharwa Bhindi / Stuffed Bhindi? Like any other stuffed dishes, this stuffed okra or Bharwa bhindi is also all about the stuffing. In different regions of India people prefer to use the various blend of spices for making this bharwa bhindi. Some prefer to add besan aka chickpea flour along with powdered spices. Some like to add a nutty texture by adding coconut, poppy seeds or roasted powdered peanuts. While others, only add powdered spices. Where does my recipe originate from? Today, I am replicating my mom’s recipe which calls only for dry masala powders. This recipe has no nuts, no gram flour, and contains only masalas. This recipe is particularly heavy on spices because ‘masala’ aka spices, is the key ingredient of this bharwa bhindi recipe. What are all the spices used for making this Bharwa Bhindi really taste worthy? The spicy bharwa filling masala is made of cumin powder (jeera powder), coriander powder (dhania powder), turmeric powder (Haldi powder), red chili powder (lal mirch powder), dried mango powder (amchoor powder), salt, and asafetida (heeng). Then lastly some freshly squeezed lemon juice is added to the powders, which gives it a perfectly balanced tang, thereby giving it an awesome taste. Why would you love this Bharwa Bhindi? 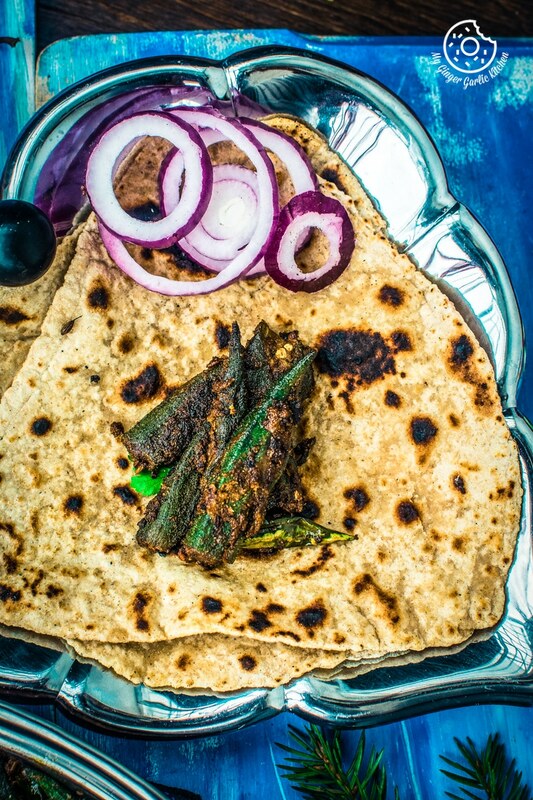 This Bharwa Bhindi (or Stuffed Okra Masala) is a 100% vegan and gluten-free recipe. You can simply serve this as a side dish with any of your favorite flatbreads. I personally like to eat it with plain paratha. So, it goes with anything flat. Does this bharwa bhindi require many ingredients? No, you don’t need many ingredients for making this bhindi. This is a stuffed bhindi recipe. And stuffing for this bhindi is made with masalas. 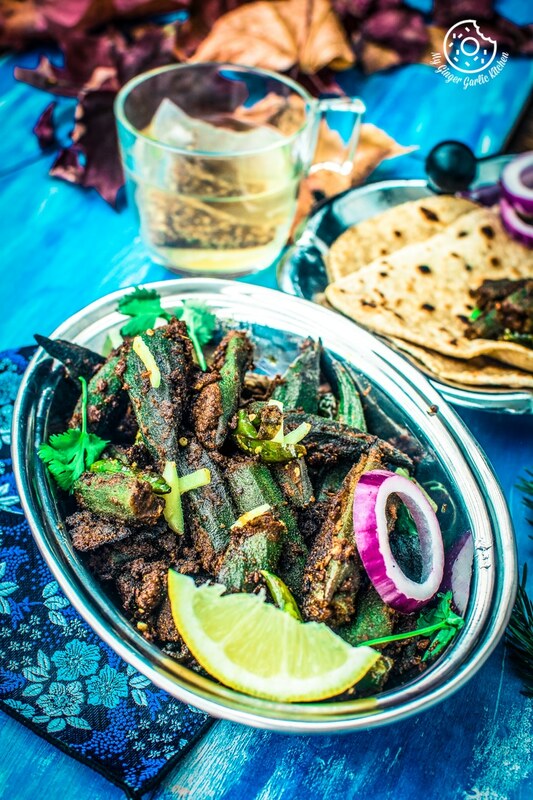 So most of the ingredients used for this bharwa bhindi recipe are various spices/masalas, such as coriander powder, cumin powder, chili powder, dried mango powder, turmeric powder and salt. These simple masalas are easily available in any Indian Masala Dabba. How to make this Bharwa Bhindi? Rinse bhindi well. Towel dry each bhindi. Make the masala stuffing by mixing them in a bowl. Trim the head of each okra. Make a slit and stuff each okra with masala stuffing. Fry green chilies and garlic, add stuffed okra in a single layer and cook covered on medium-low heat. And keep turning it occasionally to prevent it from sticking on the bottom. Finally, add the leftover masala in the center and fry it. That’s it. Is garlic must for this recipe? No, it’s not. I have added a little garlic in this recipe because it enhances the flavor. However, if you want to make it completely garlic free, then you can easily omit the garlic, according to your taste. How does this Bharwa Bhindi Taste? Bhindi or okra has a natively mild taste. So when you stuff these with intense masala filling, then this creates a wonderfully delicious, flavourful, spicy and tangy side dish. Thus the overall taste would be a softly balanced blend of masalas surrounding the typical taste of okra. Does cooking stuffed okra take a lot of time? No, it doesn’t take much time if you do preparations earlier. By preparations, I mean washing bhindis ahead of time. Trimming the top of each bhindi. Then make a slit and fill them with stuffing. If this homework is done, then cooking bharwa bhindi is easy, and doesn’t need much time thereafter. When and how to serve this Bharwa Bhindi? This is a great vegetarian side dish to make when you have guests coming over. You can serve this bharwa bhindi anytime when you want to have something light to go with your dals and curries. Some Roti, Dal and Bharwa Bhindi, and some kachumar salad is a delightfully satisfying combo. What are some important points to consider for making stuffed okra? Always use a broad pan for making stuffed bhindi. If your pan is small then you won’t be able to arrange them in a layer. By using a smaller pan, they will not cook evenly. Always use medium-low heat while making stuffed okra. This way okra gets cooked evenly without sticking to the bottom. Make sure the okra / bhindi you are using is entirely dry. 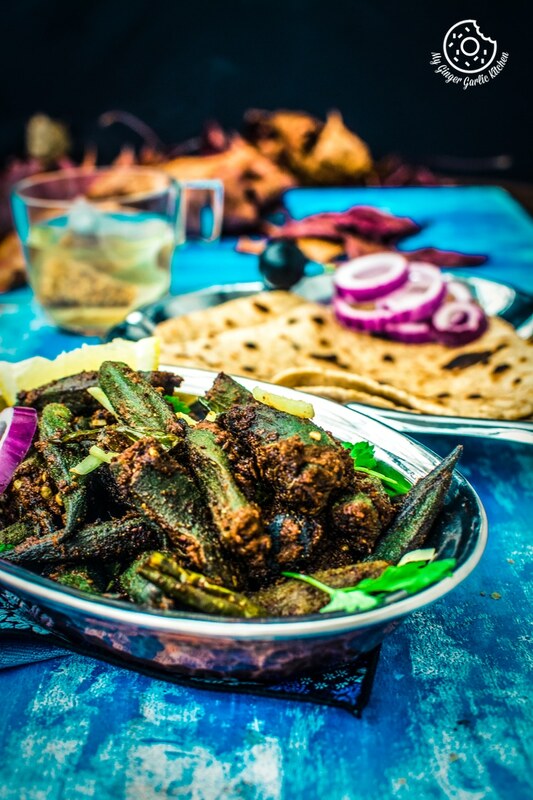 If you are looking for more ways to cook okra (Bhindi), then you might like these Okra recipes: Achaari Dahi Bhindi With Duppad Roti, Bhindi Aloo Tofu Masala Recipe. 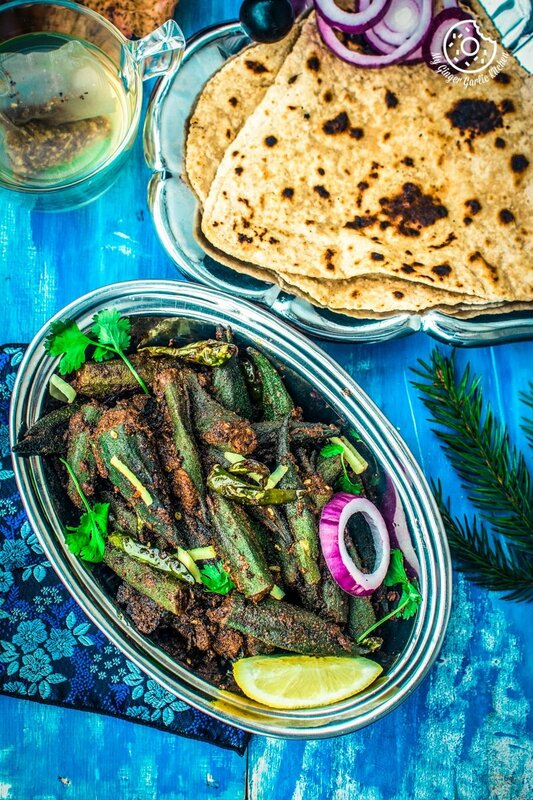 Bharwa Bhindi is a very crowd-pleasing and delicious Indian vegetarian side dish which is made with Bhindi (aka Okra or Lady Finger), which is stuffed with a tangy and spicy, powdered masala filling. This is a vegan and gluten-free dish which goes really well with any kind of roti, paratha or puri. 2. Trim the head of each bhindi. 1. To a mixing bowl add cumin powder, coriander powder, red chili powder, turmeric powder, dried mango powder, salt, asafetida and 1 tsp of lemon juice. 2. Mix thoroughly with a spoon. 3. Now add 2 tsp of water Then add 2-3 teaspoons of water to the stuffing and mix it well with the spices. 4. The stuffing masala is now ready. 5. Take one bhindi and stuff it with the generous amount of stuffing masala using a spoon or with hands. 6. Stuff all the bhindis. Keep the remained stuffing aside, we will use it later. 1. Heat 3 tablespoons of oil in a broad non-stick pan on medium heat. 3. Once the seeds start to splutter add the 5-6 green chilies and 1 tablespoons chopped garlic. 4. Let them sauté for 2-3 minutes. 5. Arrange all the stuffed bhindis in a single layer in the pan. 6. Cover the pan and cook on medium-low heat for 2-3 minutes. 7. Uncover the pan and gently stir and flip the bhinds/okras. 8. Cover the pan again and cook for 2-3 minutes. 9. After 2-3 minutes flip the bhindis again. 11. After about 6 minutes bhindis should be nicely cooked. 12. Add 2 tsp of oil to the center and add 2 tsp of masala stuffing. 13. Mix well and cook for 4-5 minutes. 14. Bharwa bhindi is ready. 1. Transfer bharwa bhindi to a serving dish. 2. Garnish with ginger slices, lemon wedge, and coriander leaves. 3. 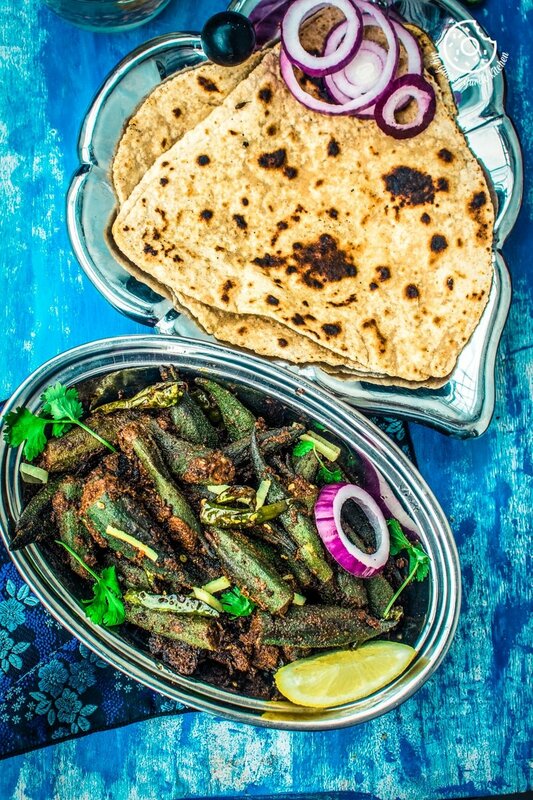 Serve bharwa bhindi hot with roti, puri or paratha.